Your hands carry more germs than any other part of your body. Don’t believe us. Just remember how you often forget to wash your hands after using the loo or the way you keep tapping, tapping, and tapping your cellphone throughout the day. All these are making your hands a cesspool of germs and you are not even aware of it! However, a hand sanitizer can help you maintain your hand hygiene in the best possible way. While more and more synthetic hand-sanitizing products are popping up in the market, it is always good to opt for their natural versions mostly made at home. So, here is everything that you need to know about hand sanitizers along with some of the most effective DIY recipes to try at home. A hand sanitizer is an antiseptic solution, which is mostly used as an alternative to traditional soap solution. It keeps us protected against fatal diseases by preventing the pathogens present in our hand from spreading. The importance of using a hand sanitizer is highly underrated. Some people are genuinely not aware of its uses while others just don’t feel that they need it. But there is really no point in taking chances with hygiene when you have such an option for dealing with it. Hence, when it comes to taking the best care of our personal hygiene, the hand sanitizer plays a big role. When you are away from a sink, a hand sanitizer containing 60-80% of alcohol can come to your rescue. According to the Public Health Agency of Canada (PHAC), a pair of contaminated hands are responsible for around 80% of common infections. In fact, proper hand hygiene is known to be the best defense against the HINI flu virus. Before digging deeper into the methods of making natural hand sanitizers at home, here are some of the most significant things you should know about them. You cannot clean your grimy hands with a hand sanitizer. But otherwise, it works even better than plain soap and water. A report by WHO revealed that alcohol-based sanitizers can reduce bacteria much more effectively while keeping hands cleaner for a longer span of time. There is a myth that frequent use of hand sanitizers makes bacteria resistant to them. But it is not at all true. Sanitizers basically work by disrupting the cell membranes of bacteria with alcohol and bacteria cannot become resistant to it. So, there is no chance of developing ‘super-bacteria’ in your body by using hand sanitizers. If you compare a hand sanitizer with anti-bacterial soap, you will find that the sanitizer is much gentler on your skin than the later one. Even though it comes with an alcohol-based formula, you can also find lots of emollients in it, which takes good care of the skin while fighting against the germs. You must know how to use a hand sanitizer to make the most of it. Start with making your hands free from all dirt and grime that are visible. Now, pour some product on your palm and keep rubbing both of your palms vigorously for next 20-30 seconds. This will ensure that the gel is distributed all over your hands. Essentially, it should be applied on your fingers, wrists, backs of your hands, and under your nails for effective cleansing. Once the hands become dry, you are done. However, you should never ever use water or a towel for rinsing or wiping your hands right after applying a hand sanitizer. This will counteract the effect of the product and spoil all your efforts. A commercial hand sanitizer is costly. Moreover, it can contain harmful chemical compounds that you have always wanted to avoid. But you can always make your own version of natural hand sanitizer at home and keep your hands healthy in a natural way. Here is a list of some of the most effective homemade hand sanitizers. Take all these ingredients in the bowl and mix them well by using the spoon. Now, just pour the mixture into the spray bottle through the funnel and your hand sanitizer is ready to use. Note: The presence of alcohol in the hand sanitizer should be at least 60 percent in order to work as an effective disinfectant. Just like the previous method, put all the ingredients in a bowl and mix well. Then, pour it into the bottle with the help of the funnel. The essential oil used in the product not only adds fragrance to it but also helps in eliminating germs from the hands. Mix all the ingredients (except the water) well in the bowl. Now, add distilled water as required to get the desired consistency. With the use of the funnel, transfer the liquid to the bottle and you are done. This homemade hand sanitizer smells divine. Note: Vegetable glycerin is an optional ingredient in this recipe. You can avoid it if you want to avoid slight stickiness. In the bowl, take all the ingredients one by one and mix them together very well. Pour the mixture into the bottle with the use of the funnel. 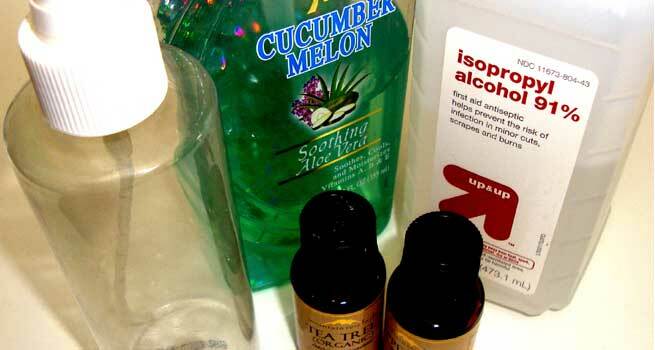 Your alcohol-free homemade hand sanitizer is ready. Use of alcohol-based hand sanitizers can make your hands dry but this one will keep them moisturized.